Who: Brett Cecil, No. 27. Left-handed starting pitcher. 6’1”, 215 LBS, down from 250 last season. 25 years old. Provenance: Dunkirk, Maryland. Drafted by the Blue Jays in the first round (supplemental) of the 2007 draft out of the University of Maryland. Go Terps. Contract Status: Resigned for one year by the Jays in the offseason. Arbitration eligible after this season. 2011 Stats: 4.73 ERA, 1.326 WHIP, 87 strikeouts and 42 walks in 123.2 innings over 20 starts with the Blue Jays. Career Stats: 4.64 ERA in 66 games (65 starts) over three seasons with the Jays. 6.3 K/9, 3.1 BB/9, 1.40 WHIP in 389.2 innings. Looking Back: It feels as though we’ve spent much of the past 18 months treating Brett Cecil as some sort of riddle, wrapped in an enigma and smothered in secret sauce. How could the 15-game winner (most on the Jays!) in 2010 devolve into a 4-11 pitcher in the space of one year? Cecil’s WHIP in 2010 and 2011 was the exact same at 1.326. His K/9 rate was 6.1 in 2010 and 6.3 in 2011. His BB/9 was 2.8 in 2010 and 3.1 in 2011. The differences are hardly earth-shattering. The numbers that stand out when comparing the two seasons are those that show hitters getting balls in the air off the Jays’ lefty. His flyball rate bumped up from 38.2% to 43.5%, and his HR/9 rate spiked from 0.9 to 1.6. Plucking from our memory we’d explain the added loft by noting the trouble Cecil had keeping the ball down in the zone last year. His delivery seemed to be a constant work in progress, especially after he showed up to spring training with a couple of miles per hour missing from all of his pitches. He’s gone from a pitcher who touches the low 90’s and averaged 90.7 M.P.H. in his 2009 debut to averaging 88.5 M.P.H. last season. Looking Forward: Funny how one year later, we’re all still waiting for Cecil’s velocity to return. Anyone who is live-tweeting the games from Florida is questioned almost immediately from Jays fans as to the speed that Cecil is showing in any given game. There ought to be a hashtag for that: #CecilRadarGunWatch? #WhatsTheVelocityCecil? Through his ascent through the system, there was talk of Cecil being a power lefty, and even the odd musing about his ability to close games. But the reports back so far would seem to indicate that Cecil has become a pitcher for whom the 90’s will be just out of reach for his fastball. If Cecil is going to succeed, he’ll have to do it with guile and control, and better location on his pitches. Cecil’s off-season weight-loss is supposed to help him finish through his delivery, and keep the ball down in the zone. Apparently, love handles and puffy midsections impede your ability to keep a downward angle on your pitches, which means that we’d probably be launching everything over the backstop at this point. Again, apologies for the further digression. 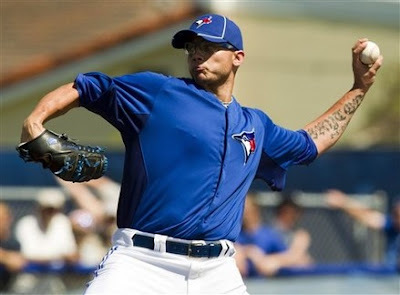 2012 Expectations: It’s not inconceivable that Cecil could find a way to take his arsenal of pitches and carve out a decent season for himself, though the Jays will likely look to him to eat innings and carry his starts through and beyond the sixth inning this season. If his newly svelte figure truly helps him keep the ball down in the zone, we could see a season closer to his 2010 performance. Not exactly the stuff that puts you over the top in the AL East, but a very useful arm at the back of the rotation. No mention of his "Hamels-level" stuff?!? I like Cecil, but I don't think he finishes the season with the jays. The reason is he will be passed on the depth chart pretty soon. And we learned enough from jojo last season. If he's doing well then I expect him to be traded. If not then someone in the minors will force AA's hand on promotion.